Setting up a new Web Project in Visual Studio 2015 is easy! 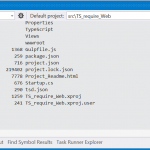 Setting up a project and making TypeScript and RequireJS work together – not all that easy. Hopefully this step-by-step guide will help you get up to speed quickly. We’re taking it from an empty web project to setting up MVC 6, TypeScript compilation with Gulp, retrieving definition files and finishing off with a module load with RequireJS. Disclaimer: Please note that this article was written using Visual Studio Enterprise 2015 RC using the beta-4 bits. So if you are using a different version, some of the information in this article will not be accurate. If you are unfamiliar with ASP.Net 5, we’ve just enabled MVC, enabled use of static files and setup a route handler for incoming requests. Add a folder to the project root named Controllers and one named Views. Inside the Views folder, add a folder named Home. Given everything is setup correctly now, it should be possible to run the project using the web command or with IIS Express. In the Visual Studio solution expand the Dependencies node and make sure all packages are marked as installed (by showing a version number). If they aren’t – right click the NPM node and select “Restore Packages”. Position in the projects root in solution explorer, press Ctrl-Shift-A and select “Gulp Configuration file”. In the gulpfile, require in the following packages rimraf, gulp-typescript, merge, and fs. Then we need to add a few gulp-tasks and configurations. For the TypeScript compilation we need to define a TypeScript Project Setting, some paths, a compile task and preferably also a watch task. Watch tasks enables automatic compilation of the TS files triggered by a save, something that makes the workflow much faster when iterating over small code changes. Under wwwroot create two folders, one named lib and one named scripts. Under the scripts folder, create a new folder named app. Test to make sure the gulp copy-task is setup correct by running it from for ex Task Runner Explorer. After it’s executed and no errors occurred, check to see if a new folder containing the require.js file has been copied to the lib folder. Create a new folder in the project root named TypeScript, under that create three new folders named: app, definitions and extdefinitions. The plan here is to keep all code that will be written to contain app logic in the app folder. The TypeScript compiler will output definition files for your code and put those in the definitions folder. And then there is the extdefinitions folder that will hold all the definition files that you have downloaded, imported or maybe written but are for code that you are not responsible for. Now – finally time to add some TypeScript files! When creating the first TS file, a popup will show, reminding you that you have to configure compilation with a task runner like Gulp or Grunt and offer to show instructions, just click “No” to continue. But there’s squiggly’s under ‘require‘ in config.ts, to remedy this we need a definition file for RequireJS. from the Package Manager Console. Edit the ‘tsd.json’ file that init generated. Set path and bundle to our previously defined paths. After it’s been installed it’s time to use it to get the definition file for RequireJS. Make sure all your TypeScript files are compiled, and run the app via the web command or IIS Express. 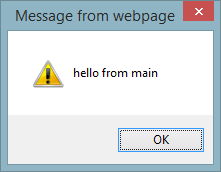 You should now get an alert box from the browser of your choice saying “hello from main”! So, that’s the main.ts code being executed sending it’s message out to the world. The end result of all this is subtle, but it’s hopefully a solid base to build upon when creating a larger application. All code can be found in my GitHub repository. 1. Try to keep all generated .js files in one folder, this way you can empty it and recompile in case anything get’s fudged (setup a clean task for the folder). 2. It’s ok to have static .js files in a project. Some developers in your team might not be comfortable with TS. Just try and keep their .js files separated from generated files. 4. If you need to use external js libraries, TSD is your friend! Great article. That’s what I’m researching today! Btw, I got CommandNotFoundException when typing npm in Package Manager Console, any ideas? You need to have Node and NPM installed and it needs to be in your path. If the installation is correct and node is in your path, it will show you the version installed. To the end of your Path variable on the “User variable” section of the Environment Variables on System Properties. When you have done that you need to reopen VS2015 and then try again. Signup to get notified about new posts!